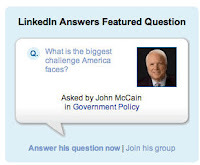 Senator John McCain debuted with a question on LinkedIn this morning, with over 500 connections in his profile – something that takes less well-known people months or even years to accomplish unless they make LinkedIn a hobby. The question, “What is the Biggest Challenge America Faces? received 70 answers in 9 hours. Althought less anwers than Bill Gates receieved, Senator McCain is the first national political figure to leverage a truly business-oriented social network to ask questions about what is important in American politics to a hyper-connected technology and business savvy network. At last count, over 1,680 people have now responded to Senator McCain’s question. We would not rule out increased momentum online for the McCain campaign as they show their savvy for using mediums not yet tested by Senators Obama or Clinton. View McCain’s linkedin group here.